Charlie McCreevy's notorious approach to managing the state's finances - if you've got it, spend it - is now coming back to haunt us. Like a profligate teenager who can't get any more money from the ATM, this Government is now back to tap the 'parents' (aka: the taxpayer) for more money to keep them in the style they've become accustomed to. More and more we read nonsense about how Ireland is a low tax country that now has to grow up and pay more taxes just like everyone else (i.e: the Scandinavians). Marc Coleman does an excellent job today in showing just how ridiculous the accusation of low taxes is when you use GNP not GDP as a comparative measure, and you allow for the fact that we have a young population. It is also worth remembering that taxes are incentives that influence behaviour - usually negative incentives at that. The chart is from a comprehensive analysis of global trends in income taxation (pdf) by Deutsche Bank Research showing the association between contribution rates (i.e. : income taxes and social security contributions as % of income from employment) and average growth rates over the past twelve years. 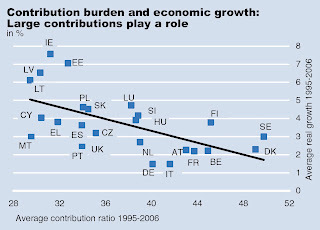 Ireland stands out as a high growth, low contribution economy. The Scandinavian countries that Left-leaning commentators like to compare us with are all down at the other end. The report is well worth reading in full, if only to prepare you for the onslaught on taxpayers that now awaits us. This optimistic attitude does not lead to institutional reform or political transformation, despite the frequent use of these themes in campaigns, but actually resigns people to the failed status quo by replacing the hard work of renovation with superficial nods to the latest political fads. At the same time, based in the conviction that every problem has a solution, politicians conclude that there are government solutions for whatever ails a nation, which necessarily means that the scope and role of government will have to increase and each new election will entail adding more and more indebtedness. The same is now true of Ireland. Like profligate teenagers whose parents are a 'call me' text message away every time they run low on cash, the Government is prepared to do everything but change their lifestyle and make the hard choices. Including living within their means. Time for the parents/taxpayers to be firm methinks. Maybe I'll move to Australia, the sun would do wonders for my psoriasis.